Vet's Kitchens' foods are hypoallergenic and free from wheat, beef, maize and soya-thought to be some of the top causes of allergies in pets. 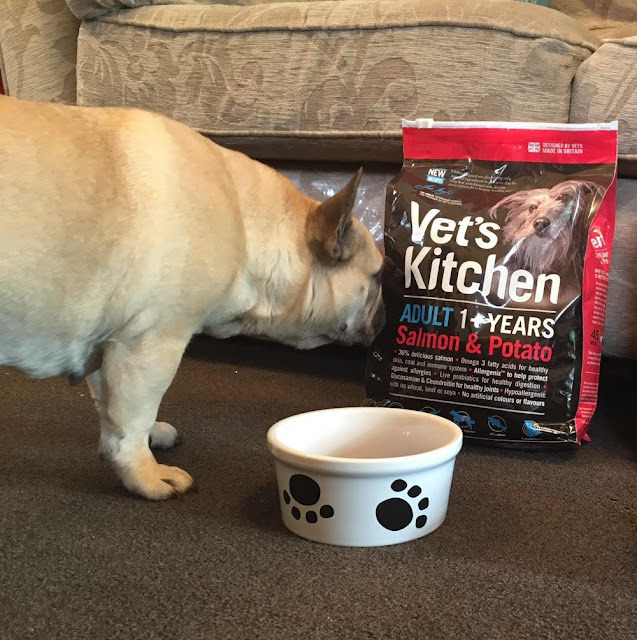 They have no artificial colours, flavours or preservatives.I was sent a month supply of dog food for my four French Bulldogs in two great flavours, Salmon & Potato and Chicken & Brown Rice.You can see Miley was very curious to try the food out and I was intrigued to find out more details of the nutritional benefits of each pack. Brown Rice provides a great source of dietary fibre with a very low glycaemic index to keep blood sugar levels steady and help metabolise fat more efficiently. After a month, I can report the below about how my dogs change in diet impacted them:Digestion - 5 paw rating, they happily ate the food straight away and had no issues. Coat quality - 5 paw rating, their coats felt smooth and glossy after eating this food for a month. General temperament - 5 paw rating, they have seemed pretty calm.